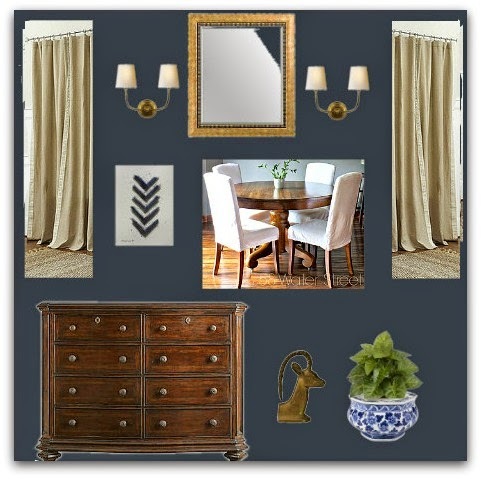 I often create a design plan before I begin a new room. This helps me visualize the things I already have, and what I need. Painting begins today. We decided on Inkwell! Curtains will be a neutral linen, very basic to balance the drama of the wall color. I'm considering relocating our bedroom dresser to the dining room. The dark stained wood will be beautiful against the dark blue. With the new closet, we really don't make use of the dresser. In the dining room it will be used to store extra linens and seasonal items. And that's about it. I'll add some brass accents and a house plant. The plan is to keep it simple. Art will be easy and simple too.